The three-day practice match between India and English cricket County Essex was Friday’s draw. In the match, Indian batsmen KL Rahul, Dinesh Karthik and Virat Kohli were performing well, while Shikhar Dhawan, Cheteshwar Pujara and Anuji Rahane were flopped. The result of the match was a draw, but Indian players took full enjoyment of this match. 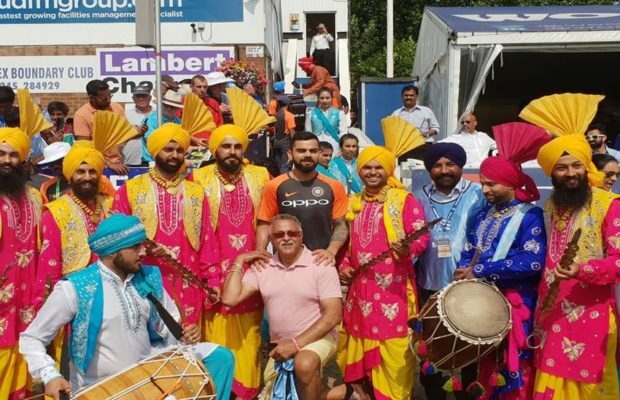 During the match, Indian captain Virat Kohli and Shikhar Dhawan were seen even from Bhangra. After the match was completed, Indian captain Virat Kohli shot pictures with artists and fans playing the drummer. During the course of the match, when the players landed on the three-day tour, they were welcomed by playing the drum. Meanwhile, the Indian team has made an image on its official Instagram. This picture is accompanied by Virat Kohli, but Vijay Mallya is also seen with him. Person in photograph bears an uncanny resemblance to India’s financial absconder Vijay Mallya, who is currently on the run. Looking at this image, the fence Virat Kohli is trolling. One Fen wrote that, “Kohli should not go there to meet Mallya. For this, he should be punished. Vijay Mallya, who runs a bank of Rs 9,000 crore, is currently in London.